More Instructional Designers are working remotely. Although home offices aren't designed for studio recording, I set up a quality recording studio in a challenging home office environment. With more experimentation with acoustics and USB mics, this is a major improvement from my previous article. 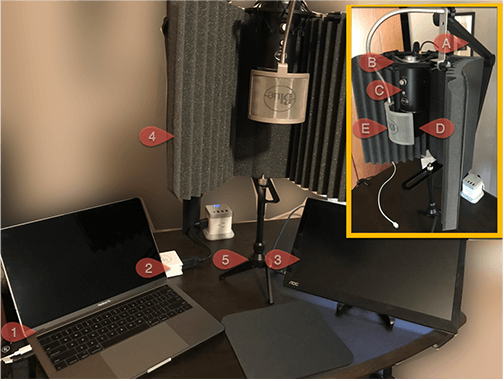 My first article, Creating A Quality Video Production Studio For eLearning At Home, was on how I created a workable quality recording studio for eLearning videos recording and production. Thankfully, there was no need to record in a closet (don't laugh!) or destroy a room by adhering acoustic tiles on the walls. The big city draw, according to Rise of the Rest, is shifting from big city tech centers (like Silicon Valley) to outlying areas. My wife and I share a home office, and escaped hectic Seattle for the mountains of north Idaho. To our surprise, our working environment wasn't quiet at all: 40 trains go by a day, wild winds, crickets, Uninterrupted Power Supplies popping at least ten times a day, and even a motor speedway nearby. Unreal. The solution has been to be smart about scheduling your work, choosing a location in your house to work in, and using the proper tools. If you want anything close to the quality of a Lynda.com eLearning recording, never consider a built-in mic. 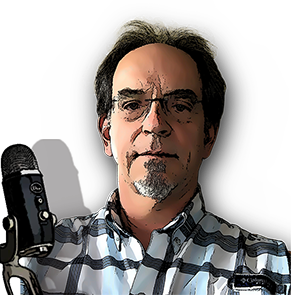 A future article will present an easy way to set up an XLR mic studio using almost all of the same gear and recording environment in this article. 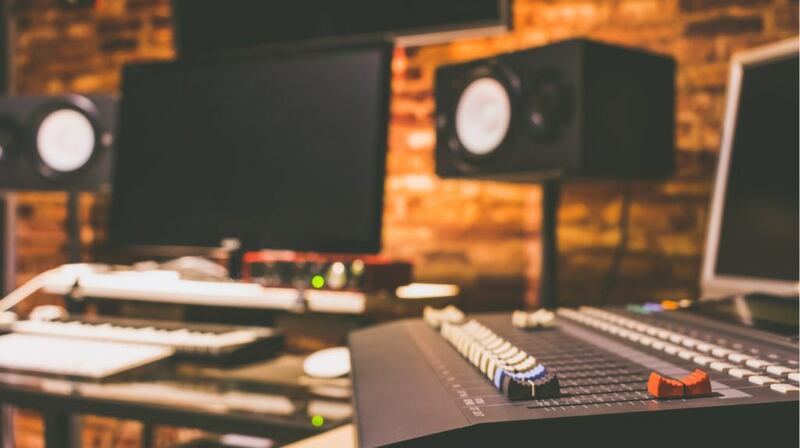 This article will focus on selecting the best USB mic for a home office studio. For any machine to be useful in the recording and editing, it must be a capable, high-performing system. An Intel i7, 8+ GB RAM, quiet SSD disks, high-resolution displays (Retina, 4K, or 5K), and Thunderbolt 3/USB-C ports. In my initial round of audio tests in our home office, the results weren’t good at all due to the hum of disk drives, power supplies, and other equipment. For the Blue Designs Yeti Pro, I mistakenly used omnidirectional mode instead of the preferred cardioid mode. It also didn’t help that the floors were all hardwood. That caused the voice recordings to have a slight echo and tinny sound. Background noise was very noticeable. Using audio software tools to remove the noise resulted in inferior voice quality. Soundproofing the recording area didn’t seem to make much difference either. 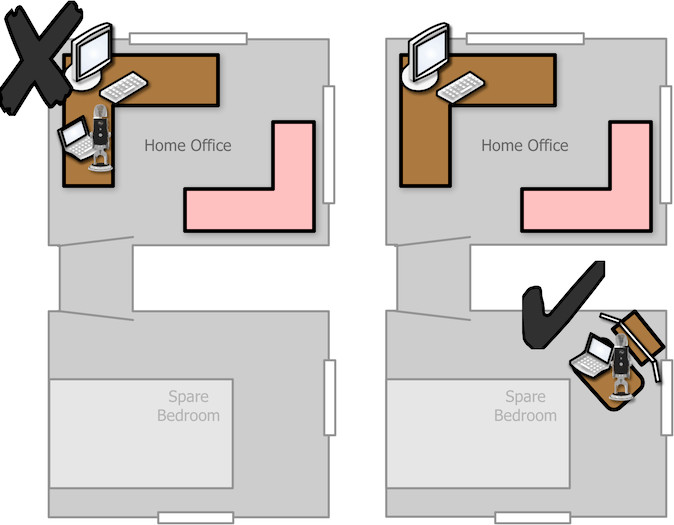 Home Office Or Spare Bedroom? My instructional video work must support recordings of software apps running on either Macs or PCs. For that reason, I can place a laptop on a height-adjustable laptop table that can be rolled into a spare, carpeted bedroom. I can record voice and apps on either a Mac or Windows laptop. I also use an external video monitor that is capable of matching the resolution of the final 720p (1280 x 720 pixels) video recording. The laptop’s hi-res display can be used to monitor the recording status. I chose powerhouse 13-inch laptops to record on MacBook Pro 13 (shown above), HP Spectre 13T, or the Dell XPS 13. I stayed clear of larger laptops to conserve table space. I found one 65W AC power adapter that supports all three laptops from LifePowr, a Belgium company. US and EU plugs are included, too! Although there are several USB-C portable external monitors available on the market, I selected the AOC i1601fwux. It doesn’t require external power and is configurable for different display resolutions. I use 720p for all app recordings. I needed an isolation shield behind the mic, and I discovered the Aurelex Acoustics MudGuard 2. Its unique convex shape does a masterful job of not only isolating outside noise but absorbs voice to produce a nice "dry" tone. The compact Neewer Adjustable Mini Stand supports the lightweight Mudguard isolation shield. I found that pretty amazing. A. The amazing Blue Compass boom arm is the best quality device for the price. B. The Blue Radius III shock mount with the Blue Yeti mic couldn’t fit in the pocket area of the isolation shield. So, I chose the Knox Gear Blue Yeti shock mount instead. C. The Blue Yeti Pro is my mic of choice due to its versatility, expanded recording range, and ability to use an XLR interface instead of USB. D. The fitted Vocalbeat Foam Windscreen absorbs gusts of air and fits right over the mic. What happens when I change between a Windows and Mac laptop? 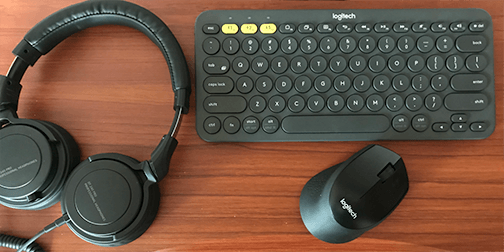 The external monitor, mic, keyboard, and mouse should be able to easily connect to either the PC or Mac laptop. The overall price for this entire arrangement (not including software) is about $1,000. This compares favorably to higher-end equipment that I priced well over $2,500. What About A Headset To Record? Although the laptop’s display could be used for managing the recording, what about reading a script while recording a voiceover? 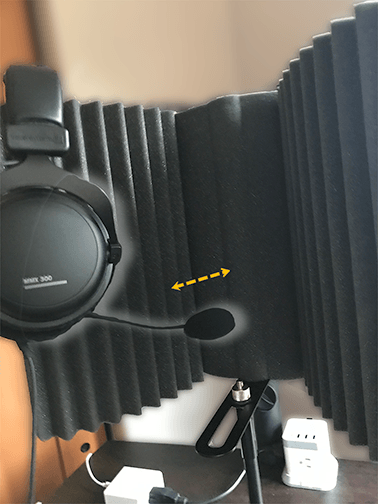 Looking back at the third photo in this article, there is room below the mic and in front of the isolation-shield stand to hold up a script. I found Ultimate Support’s Ergonomic Compact Laptop Stand that can hold an iPad or a notepad. 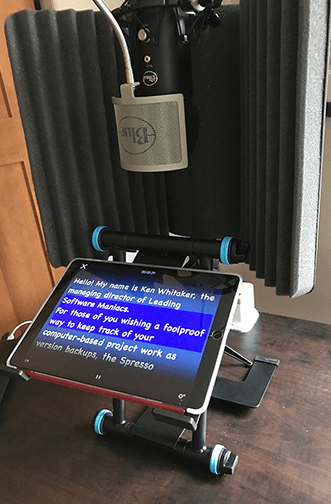 Teleprompting iOS apps, like PromptSmart Pro, listen to your voice and automatically steps you through your script. Wow!